The Cockapoo is a hybrid, a cross between a Cocker Spaniel and a Poodle. It looks something like a Cocker Spaniel with a Poodle coat. Some breeders stick with the original basic Cocker/Poodle mix, while others seek to make the breed more a hybrid with multi-generational crosses. One should understand the breeder's policy in this regard. 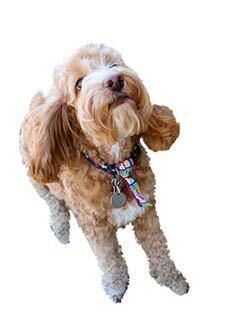 The Cockapoo originated in the USA. Cockapoos range from under 6 pounds to over 19 pounds, depending on the type. Cockapoos may be various colors including white, cream, tan and all combinations of these. The Cockapoo is a low shedding dog breed, but still requires a lot of grooming. Sweet and loyal, Cockapoos are known for being easy to train, non destructive, patient and eager to please. Since Cockapoos glean positive qualities from both the Cocker Spaniel and the Poodle, they are indeed of very pleasent temperament. The Cockapoo has a lower rate of skin problems than the Cocker Spaniel. In general the Cockapoo's rate of genetic defects are lower than either the Poodle or the Cocker Spaniel. A Cockapoo can be expected to live for 13 to 15 years. Cockapoos can live in apartments or get plenty of exercise from a small yard. These dogs prefer colder climates. The Cockapoo is not recognized. This adorable little hybrid is the result of crossing a Cocker Spaniel with a Poodle. Known in the United States since about 1950, many Cockapoo puppies are now the result of breeding between two adult Cockapoos, rather than starting with the original purebreds. It is not acceptable to breed a Cockapoo with a Cocker Spaniel or with a Poodle. This would produce a dog that is ¾ of one breed and ¼ of the other, while the Cockapoo is defined as a 50:50 combination of DNA. In other countries, this same dog is called the Spoodle, resulting from a different combination pattern of the same two breed names. The Cockapoo draws its characteristics from both of its parent breeds. 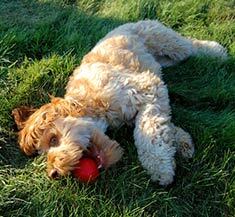 From the Cocker Spaniel, the Cockapoo inherits most of his personality traits, such as being outgoing and loving. The Cocker Spaniel genetics also bring a sturdy body, as well as the ear infections common to floppy-eared breeds. The Poodle inheritance includes intelligence, high activity level, low-level shedding, and low dander production. The American Kennel Club does not recognize the Cockapoo as a purebred because successive generations do not consistently produce predictable characteristics of the breed. For example, if you bred two poodles to each other, you are passing on to the puppies pretty similar DNA from both sides. Therefore, you would expect that the puppies would look similar to both of the parents and would be likely to have the desirable characteristics responsible breeders try to promote by selectively breeding only the most outstanding examples of the poodle breed. You've heard the old joke: "She has her grandmother's face…and boy, does it look better without the wrinkles!" (Thanks. I'll be here all week. Don't forget to tip your veal and try the waitress!) The point is that certain familial traits are passed from one side of the family or the other, and each side has very different DNA. This is what happens when you cross two different breeds to create a hybrid. Any given puppy may inherit mostly Cocker characteristics or mostly Poodle characteristics or a mish-mash of both. A breed standard simply cannot be devised at this time that will apply to most Cockapoos because there is a huge variance in looks and temperament from dog to dog depending on which parent breed they favor. However, there are three major Cockapoo clubs in the United States working to establish the Cockapoo as a recognized breed by breeding Cockapoos among themselves rather than by starting with a Cocker Spaniel and a Poodle. Continually breeding Cockapoo to Cockapoo should produce the same results as purebred breeding, that is, the consistent production of predictable characteristics. Some purebred breeders will tell you that a hybrid dog inherits only the worst tendencies of each of the parent breeds. This may be a glass half-full vs. glass half-empty type of argument. What Cockapoo breeders have noted is that the Cocker-Poodle mix brings out the best in both breeds, known as hybrid vigor. In fact, Cockapoos have a longer life span than many dogs of their size, living as long as 18 to even 22 years. In addition, by crossing two different breeds, you are enlarging the gene pool, thus reducing the chances that defects will be reproduced in successive generations. The Poodles most commonly bred to Cocker Spaniels are the toy and miniature. The Toy Poodle stands less than 10 inches and weighs just 6 to 9 pounds. The Miniature Poodle stands 10 - 15 inches and weighs 15 to 17 pounds. The Cocker itself (which is usually the dam in the mating) stands 14 to 17 inches tall and weighs 25 to 34 pounds. The mating produces a Cockapoo somewhere in between the two, standing 10 - 15 inches tall and weighing 6 - 20 pounds. The wide range in the Cockapoo's stats is likely the result of the fact that some breeders use toy poodles, producing Cockapoos at the low end of the range, while others use miniature poodles, producing the larger Cockapoos. The proposed breed standard for the Cockapoo includes four ranges to differentiate between the various sizes. A Teacup Toy is under six pounds, a Toy is 6 - 12 pounds, a Miniature is 13 - 18 pounds, while a Maxi is over 19 pounds. The coat of a Cockapoo may be any color. The style ranges, as you might expect, from the defined curls of a Poodle to the wavy, nearly straight, hair of a Cocker. However, the dog should not totally resemble either of the parent breeds. 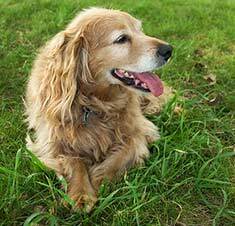 The fur around the eyes is generally trimmed to prevent the dog's vision from being obscured. Other than that, the fur may be clipped to a 2 - 3" "puppy cut" or left naturally long, which requires frequent brushing to prevent tangles. The tail is undocked and may be carried straight or curled. That said, the planned standard will stress disposition and health much more strongly than appearance. A Cockapoo should be neither aggressive nor shy. The Cockapoo Club of America recommends looking for a puppy with a calm, mellow disposition, sweet and patient nature, intelligence, loyalty, friendliness, sturdiness, stamina, and good health. Progressive Retinal Atrophy, a group of degenerative eye diseases which can lead to blindness. Dogs which will be used for breeding should first be tested using the protocol set forth by the Canine Eye Research Foundation (CERF) to assure that this genetic disease is not present. Patellar Luxation, a genetic disease which causes the kneecap to stray from its normal location. Surgery can correct this problem when it is found in a puppy. Hip Dysplasia, which can be found by a testing protocol developed by the Orthopedic Foundation for Animals (OFA). Again, this testing should be done before any breeding occurs, even though this disease is primarily associated with larger dogs. Legge-Calves-Perthes Disease, or aseptic necrosis of the femoral head. This disease is more common in small animals than is hip dysplasia. This inherited disease causes the blood supply to the top of the thighbone to become compromised, causing the bone to die. When necrosis is discovered, a surgeon must remove the affected section of the bone, and the dog then undergoes extensive physical therapy to recover use of the leg. When choosing a breeder, prospective buyers should ask to see the parent dogs' CERF and OFA certifications and should be able to visually inspect the parents for any obvious lameness or other defects prior to purchasing a puppy. Once genetic health is properly assured, the choice from among a litter of puppies should be temperament. Keep in mind that the planned breed standard is much more about how the dog acts than how he looks. A happy, outgoing, intelligent, and active dog will provide the family with lovable companionship for years and years to come. Find Cockapoo Puppies with our Free Breeder search!